The annual Logan Martin Lake cleanup collects tons of refuse and trash from around the lake every year. 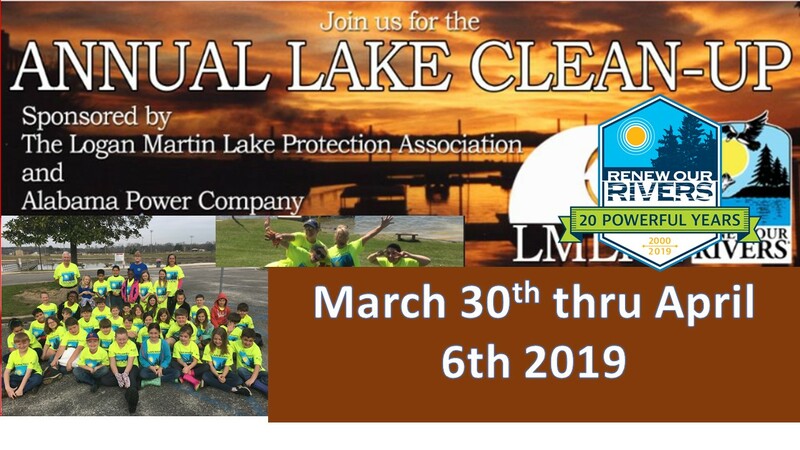 The 2019 Cleanup dates will be March 30th through April 6th, 2019. If you have questions call Mike Riley at 205-531-2372. Pick up trash along your shoreline or designated part of the lake. Return the full bags and trash to the collection site. Please don’t put lake trash in the city or county containers. Renew Our Rivers has grown from a single river cleanup event in Gadsden to a nationally recognized campaign that includes Alabama, Georgia, Mississippi and the Florida panhandle, six river systems and brings together more than 10,000 volunteers. A partnership between Alabama Power and those interested in keeping our waters clean.